My husband and I are taking a 5 day trip with some of our besties soon. YAY! Happy 40th Jenn!! Anyway, since we will be somewhere pretty remote I want to be sure I bring some good healthy food. Of course, I plan to bring some my regular travel snacks (post here) and of course my purposeful snack which goes with me everywhere. However, I really wanted to bring lots of good protein. I saw some grass-fed beef jerky at Publix the other day. I was actually so excited that they had it that I almost bought it. But then I realized it was $7.50 for 2 oz of meat. I think I was buying it more for support and approval than anything else (keep selling healthy stuff Publix!). But really, I can eat 2 oz. of meat in about 2 seconds. So then I searched high and low for good protein bars. I really wanted some that had a good source of protein. I also wanted some that were casein free (so no whey protein). Quest bars are great if you can do dairy, but I can’t. Kind bars (with only 5 grams of sugar) would have been great but no almonds for me because I’m taking a break. And the Epic bar that looks like brains (though I hear they are decent! ), but $2.75 for 1.5 ounces seemed too pricey. I just couldn’t come up with any good options. Then it hit me…I’ll make my beef jerky!! 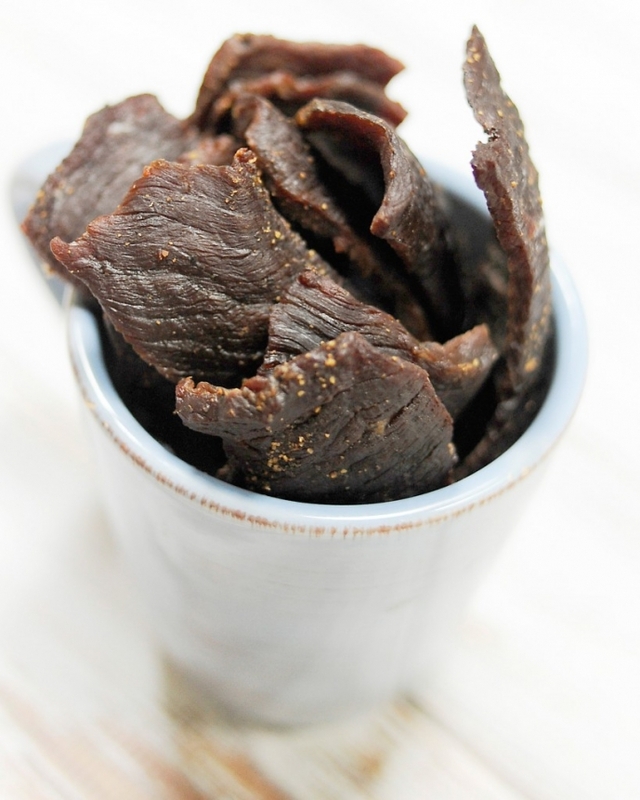 I totally forgot that I use to make beef jerky and it’s super easy! So $30 later, I’ve got 24 oz. (versus the 8 or so oz. I would have gotten for the same price from the Publix) of grass-fed beef jerky that will be perfect for my trip. Guys, this is CRAZY easy to make. The hardest part is cutting the London broil (you need a really lean meat) into thin slices. But, if you freeze the meat for an hour or two, it is actually really easy to cut. Or actually, an even easier way to cut it…is to grin and ask nicely the sweet folks behind the meat counter at Whole Foods. They’re always happy to cut itinto jerky-sized slices. I love my WF! Whether you’re going somewhere for fall break or not, this makes for a great snack!! Happy fall y’all! Place the meat in the freezer for 1 to 2 hours to make it easier to slice. Remove from freezer and trim any visible fat. Then slice is AGAINST the grain into thin strips about ¼ inch thick. In a plastic freezer sized bag, combine all of the ingredients and let it marinate for at least 4 hours or overnight. Preheat the oven to 170 degrees if you aren’t using a dehydrator. On a wire rack or parchment paper on the baking sheet, lay the meat out flat, but be sure it is not touching or overlapping. Cook for 4-6 hours (depending on thickness) until the desired texture is reached. Flip the meat once or twice while cooking. If using a dehydrator, allow it to dehydrate for 4-5 hours. 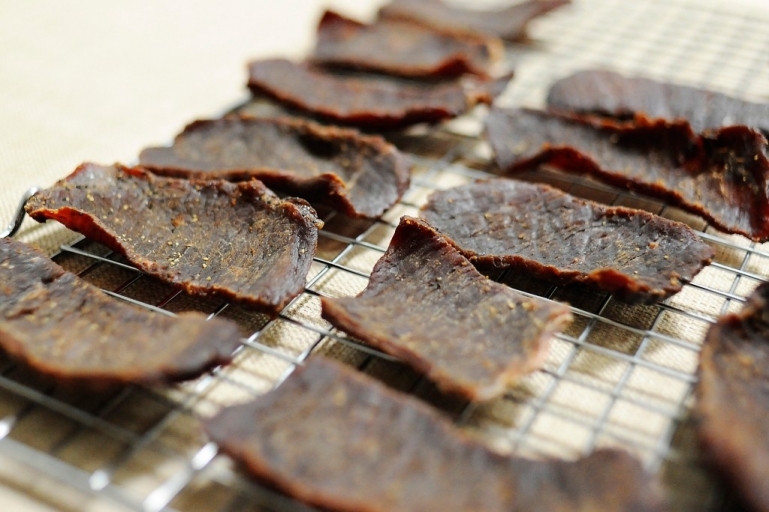 Store the jerky in the fridge or freezer but it is fine to keep it at room temperature for a couple of days.